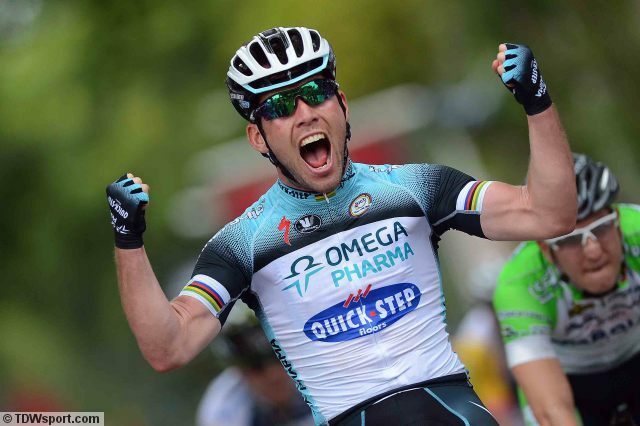 With four stage wins in last weeks Tour of Qatar Mark Cavendish looked like he was right at home with his new team Omega Pharma Quick Step. Cav a last minute team leader following the enforced through injury withdrawl of Tom Boonen didn’t let a tumble at the start of the final stage prevent him from claiming the overall victory either. He certainly seems like a happier rider in a team that will be geared to riding for him and him alone in the races he enters this year. It would be unfair to suggest that Cavendish was anything less than a team player at Sky last year. The image of last years rainbow jersey stuffed with bidon’s for Wiggins and co demonstrated that he knew the role he had to play in Team Sky’s famous victory. With the exception of the final stage win on the Champs Elysee Cavendish underlined his superiority over the rest of sprinters by fashioning winning positions in the absence of any real train gang. Taking to Twitter over the last week he was unstinting in his praise of the work his OPQS colleagues had done on his behalf and the teams dominance over two thirds of the race has placed an early but significant marker on the team being a major contender for the forthcoming classics and later grand tour sprint stages. For Cavendish it seems fair to say that he is happiest, purely based on his social media content, when he had a team focused on delivering him at the right place and time to do what he does best. There was a noticable difference between his remarks after his unexpected stage 2 win and the later stage 18 victory where his Sky teammates had chased down a breakaway. OPQS looked like the most obvious choice for Cav as soon as he began to drop heavy hints that he didn’t see a future for him in Sky’s GC focused team. It will be interesting to see if is able to replicate or even exceed the highs of his 2009 season at HTC where he dominated the sprints at the Tour de France winning six stages. There remains a slight question mark over how OPQS will be able to accomodate two proven winners and arguably joint team leaders in Boonen and Cavendish. Boonen will obviously favour the classics but in an event where both are selected team tactics should be interesting to study. Next Next post: Why are we waiting?